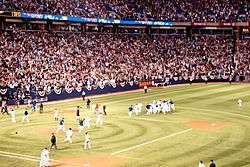 The 2007 National League wild-card tie-breaker game was a one-game extension to Major League Baseball's (MLB) 2007 regular season, played between the San Diego Padres and Colorado Rockies of the National League's (NL) West Division to determine the NL wild card. It was played at Coors Field in Denver, Colorado, on October 1, 2007. The Rockies won the game 9–8 in thirteen innings on a controversial play at home plate. The game was necessary after both teams finished the season with identical win–loss records of 89–73. The Rockies won a coin flip late in the season, which awarded them home field for the game. Upon winning, the Rockies advanced to the NL Division Series where they swept the Philadelphia Phillies. After advancing, they swept the Arizona Diamondbacks in the NL Championship Series, winning their first pennant in franchise history. However, the Rockies were, in turn, swept in the 2007 World Series by the Boston Red Sox, ending their season. In baseball statistics the tie-breaker counted as the 163rd regular season game for both teams, with all events in the game added to regular season statistics. Coors Field played host to the tie-breaker as a result of a coin flip during the season. The 2007 season saw heavy competition between the Padres and the Arizona Diamondbacks for the National League West divisional title. The Padres spent 52 days with at least a share of the lead, while the Diamondbacks spent 89 total days atop the division and ultimately won by a game with a record of 90–72. The Rockies spent just three days, last on April 6, with a lead in the division. Notably the Diamondbacks scored 20 fewer runs than their pitchers allowed, one of just five teams in MLB history to make the playoffs despite being outscored during the season. In addition to the divisional race, the competition over the wild card continued to the last day of the season. Six teams in the 2007 National League finished within five games of one another: the aforementioned Diamondbacks, Padres, and Rockies along with the Philadelphia Phillies, New York Mets, and Chicago Cubs. The Diamondbacks, Phillies, and Cubs won the Western, Eastern, and Central divisions respectively. Meanwhile, the 2007 Mets underwent what was described in the New York Times as "one of the biggest collapses in baseball history", becoming the first team with a seven-game divisional lead with only 17 games remaining to finish outside of first place, losing the Eastern division to the Phillies on the final day of the season. Also, at 88–74, the Mets finished a single game behind the Rockies and Padres' 89–73 record in the wild-card race. 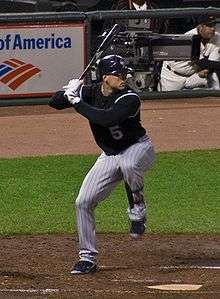 While the Padres had been a consistent presence amongst the league's top teams during the 2007 season, the Rockies finished the first half with a .500 record of 44–44. They propelled themselves into the wild-card race, however, by going 46–29 in the second half of the season including a Rockies' season-best 11-game winning streak from September 16 through September 27 and ultimately tied the Padres regular season record. With the Rockies and Padres holding the best non-division winning records in the league a tie-breaker was necessary to determine the wild-card winner. A coin flip conducted earlier that September set the Rockies' home park of Coors Field as the location for the game. Rockies outfielder Matt Holliday, seen here during the regular season, scored the game's controversial winning run. The starting pitcher matchup saw eventual Cy Young Award and Major League Baseball Triple Crown winner Jake Peavy against the Rockies Josh Fogg, who teammate Matt Holliday nicknamed "Dragon Slayer" for his strong performances against ace starters throughout the season. The Rockies opened the bottom of the first inning with a leadoff double by Kaz Matsui, followed by a Troy Tulowitzki single and a walk to Matt Holliday to load the bases. Matsui scored on a sacrifice fly by Todd Helton and Garrett Atkins made the game 2–0 with a single which scored Tulowitzki. Yorvit Torrealba later added to that lead, leading off the bottom of the second inning with a solo home run. The Padres took the lead in the top of the third, however, loading the bases via singles from Peavy and Scott Hairston and a walk to Brian Giles. Adrian Gonzalez then hit a grand slam home run, making the score 4–3. This was Gonzalez' first career grand slam. Khalil Greene then singled, advanced to third base on a double by Josh Bard, and scored on a ground out by Brady Clark. Helton homered in the bottom of the inning to close the gap to 5–4 in favor of San Diego. The score remained the same through the fifth inning. Fogg was relieved by Taylor Buchholz in the top of the fifth and, following a double by Tulowitzki, Peavy allowed the game-tying run to score on a Holliday single. Seth Smith, pinch hitting for the pitcher in the bottom of the sixth, hit a triple and then scored on a sacrifice fly by Matsui to give the Rockies a 6–5 lead. The Rockies' Garrett Atkins appeared to homer in the bottom of the seventh, extending the Rockies lead, but umpires ruled that the ball hit padding on the outfield wall, which was still in play, and awarded Atkins a double. Jamey Carroll pinch ran for Atkins, but no runs scored in the inning. The Rockies brought in closer Brian Fuentes in the top of the 8th, but the Padres re-tied the game when Geoff Blum singled to lead off the inning, advanced to second base on a wild pitch, and scored on a double by Brian Giles. This was Fuentes' seventh blown save of the season. The game remained tied through nine innings, forcing extra innings. There too the game stayed tied until the top of the 13th inning when Giles singled off of Jorge Julio and scored on a home run by Scott Hairston. Ramón Ortiz relieved Julio and no further runs scored in the inning, but the Padres entered the bottom of the 13th with an 8–6 lead. The Padres brought in Trevor Hoffman to secure the game and a wild-card victory. However, Hoffman blew the save, allowing doubles to Matsui and Tulowitzki and a triple to Holliday which tied the game 8–8. Hoffman then intentionally walked Todd Helton leaving baserunners at first and third base. Carroll then hit a line drive to right fielder Brian Giles. Holliday tagged up at third and slid headfirst on a close play at home plate. Home plate umpire Tim McClelland ruled Holliday safe on the sacrifice fly, and the Rockies won the game 9–8. During the final play Padres catcher Michael Barrett attempted to block home plate from Holliday's slide while receiving the ball on a throw from Brian Giles. Holliday arrived at the plate before the ball did and the ball bounced away from Barrett. Some controversy arose after the game as to whether Holliday had actually touched home plate or if Barrett had successfully blocked him. Several sportswriters, such as Jeff Passan of Yahoo! Sports and Mark Kiszla of The Denver Post, said outright that Holliday never touched the plate. Kiszla referred to the moment humorously, saying "When folks retell this story 100 years from now, he still will not have touched home plate." Padres manager Bud Black and first base umpire Ed Montague both agreed with McClelland's safe call. Barrett said he was unsure but "never, ever second-guessed Tim McClelland at home plate." If McClelland had ruled Holliday had not touched the plate during his slide Barrett would have had the chance to tag out Holliday, preventing the winning run. Colorado's win clinched the team's second post-season berth in franchise history, and the first for their first baseman Todd Helton. The Rockies swept the Phillies in the 2007 National League Division Series and the Diamondbacks in the 2007 National League Championship Series (NLCS) to win the franchise's first National League pennant. This streak, in combination with the Rockies performance at the end of the season, meant the Rockies had won 21 of their last 22 games. The last National League team to win 20 of 21 games at any point in the season were the 1936 New York Giants. The Rockies also opened the playoffs with seven straight wins, the 1976 Cincinnati Reds were the only other team in major league history to do so. The Rockies moved on to the 2007 World Series with their NLCS win, where they were swept by the Boston Red Sox. The game counted as a regular season game in baseball statistics. If Matt Holliday had gone 0 for 5 in the game he would have lost the batting title to Chipper Jones. However, Holliday went 2 for 6 and won the title with a batting average of .340. Also, Holliday's triple and run batted in (RBI) in the 13th gave him 137 RBI in total, winning the RBI crown over Ryan Howard by 1. Holliday's teammate Tulowitzki believed Holliday was the league's most valuable player, but he ultimately finished a close second to the Phillies' Jimmy Rollins in the Most Valuable Player Award voting. Also, Padres' starter Jake Peavy increased his earned run average (ERA) from 2.36 to 2.54 in the game and added six strikeouts to his season total. Peavy ultimately won the National League wins, strikeout, and ERA titles. These titles combined to give Peavy a pitching Triple Crown and he went on to win the Cy Young Award unanimously. Finally, despite an error in the game, the Rockies set the single-season major league record for team fielding percentage (.98925), breaking the 2006 Boston Red Sox mark of .9891. "October 1, 2007 San Diego Padres at Colorado Rockies Box Score and Play by Play". Baseball-Reference.com. Retrieved April 12, 2010. 1 2 3 "2007 San Diego Padres Schedule, Box Scores, and Splits". Baseball-Reference.com. Retrieved April 12, 2010. 1 2 "2007 Arizona Diamondbacks Schedule, Box Scores, and Splits". Baseball-Reference.com. Retrieved April 12, 2010. 1 2 3 "2007 Colorado Rockies Schedule, Box Scores, and Splits". Baseball-Reference.com. Retrieved April 12, 2010. ↑ Posnanski, Joe (September 22, 2009). "Tigers-Twins in AL Central is best in weak year for playoff races". Sports Illustrated. SI.CNN.com. Retrieved April 12, 2010. 1 2 3 "2007 National League Standings & Expanded Standings". Baseball-Reference.com. Retrieved April 12, 2010. ↑ Shipigel, Ben (October 1, 2007). "Mets Complete Stunning Collapse". The New York Times. Retrieved April 12, 2010. ↑ Bodley, Hal (October 1, 2007). "Mets' collapse helps Phillies forget '64". USA Today. Retrieved April 12, 2010. ↑ "2007 New York Mets Schedule, Box Scores, and Splits". Baseball-Reference.com. Retrieved April 12, 2010. ↑ Singer, Tom (September 7, 2007). "Coins flipped for tiebreaker scenarios". MLB.com. Retrieved April 12, 2010. ↑ Knisley, Michael (September 30, 2007). "Rockies have Fogg-y outlook on facing Peavy". ESPN.com. Retrieved April 12, 2010. ↑ "Dragon Slayer: Rockies pitcher Josh Fogg enjoys painting of himself hanging in locker". USA Today. Associated Press. October 13, 2007. Retrieved April 12, 2010. 1 2 Moss, Irv (October 2, 2007). "Bests, worsts & numbers from Monday's tiebreaker". The Denver Post. Retrieved April 12, 2010. 1 2 3 "October 1, 2007 San Diego Padres at Colorado Rockies Box Score and Play by Play". Baseball-Reference.com. Retrieved April 12, 2010. 1 2 3 "San Diego Padres vs. Colorado Rockies – Recap – October 01, 2007". ESPN.com. Associated Press. October 1, 2007. Retrieved April 12, 2010. ↑ "Playoff Tiebreakers". MLB.com. Archived from the original on 19 March 2010. Retrieved April 12, 2010. 1 2 3 4 Bloom, Barry (October 2, 2007). "Rocky horror becomes heroics". MLB.com. Retrieved April 12, 2010. ↑ Passan, Jeff, Twenty-one wins, 21 reasons, Yahoo! Sports, October 17, 2007. Accessed 2009-03-10. Archived 2009-05-16. 1 2 Kiszla, Mark (October 2, 2007). "Touching display, or not". The Denver Post. Retrieved April 12, 2010. ↑ "Colorado Rockies Team History & Encyclopedia". Baseball-Reference.com. Retrieved April 12, 2010. 1 2 "2007 Colorado Rockies Batting, Pitching, & Fielding Statistics". Baseball-Reference.com. Retrieved April 12, 2010. 1 2 3 Dodd, Mike (October 16, 2007). "Big winning streak puts Rockies in rare air". USA Today. Retrieved April 12, 2010. ↑ "Information for Monday's tiebreaker game at Coors Field". MLB.com. September 30, 2007. Retrieved April 12, 2010. 1 2 "Holliday comes through big to take first batting title". ESPN.com. October 2, 2007. Retrieved April 12, 2010. ↑ Moore, C.J. (October 2, 2007). "Holliday plays like an MVP – as usual". MLB.com. Retrieved April 12, 2010. ↑ "Rollins, who spurred Phils into playoffs, wins MVP". ESPN.com. Associated Press. November 21, 2007. Retrieved April 12, 2010. ↑ "Jake Peavy 2007 Pitching Gamelogs". Baseball-Reference.com. Retrieved April 12, 2010. ↑ "Jake Peavy Statistics and History". Baseball-Reference.com. Retrieved April 12, 2010. ↑ "2007 National League Pitching Leaders". Baseball-Reference.com. Retrieved April 12, 2010. ↑ "Peavy is 12th-ever unanimous NL Cy Young". ESPN.com. Associated Press. November 16, 2007. Retrieved April 12, 2010. ↑ Rooney, Pat (October 16, 2007). "Sure hands + strong arms = winning edge". Rocky Mountain News. Retrieved April 12, 2010.